Craft beer has been sweeping the nation over the past couple decades and the selection of good brews to choose from have extended into the thousands. While there are a few breweries that stand out above the rest, there is no shortage of people crafting amazing beers in their homes that could become the next big thing. 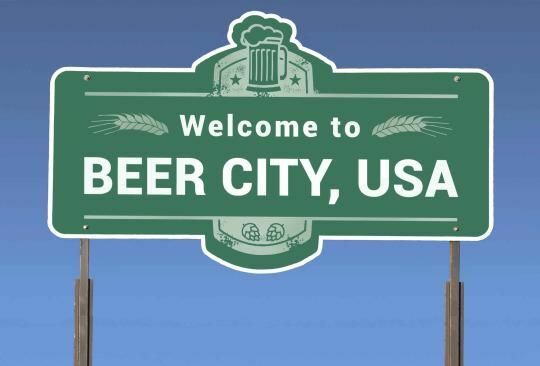 A few select cities around the world are known for their hop heads so we compiled a list of the best cities to enjoy a pint of craft beer. Colorado has been stepping up its craft brewing talents and Denver is considered the Mecca. Home of the Great American Beer Festival since 1984, thousands of people travel to Denver to enjoy the best of the best. Around every corner, you will find a bar serving up some local brews, and since IPAs are best enjoyed fresh, it’s an added bonus that the travel time of the liquids is pretty short. Some notable brewing companies that have sprung out of the mile high city include Great Divide Brewing and the nationwide known, Blue Moon, owned by the company that proudly displays the Rockies on their cans, Coors. Boston is not only the birthplace of American independence through the Boston Tea Party but also the home of one of the most iconic craft beer companies, Samuel Adams. Boston Beer Company, the owner of Samuel Adams, has been pushing the limits of craft brews since the 80s. They were one of the first to create the “Extreme Beer” with the creation of Utopias. Although the number of craft breweries has lessened throughout the years, it is important to acknowledge where it all began. With beautiful creations such as beer cheese soup, there is no surprise Milwaukee knows what they are doing when it comes to their beer. Home of the iconic Pabst, Schlitz, Miller and Blatz, Milwaukee is one of the best places to wet your whistle without breaking the bank. The city has evolved over the years to join the craft brew movement and now includes companies such as Milwaukee Brewing Company and Sprecher Brewing. Good food, beautiful beaches and excellent beers. What more could you ask for? San Diego is home to more than 100 licensed breweries and that does not include those who brew in their garages. San Diego Beer Fest is held every January and the best part is you can dress in a t-shirt and shorts and not have to worry about catching a cold. Some of the most famous companies to come out of the area are Stone Brewing Company, Green Flash, Alpine, Coronado and Ballast Point that just sold for $1 billion (yes, with a “B”). In one of the few places where you can find more breweries than Starbucks, Portland is the place to be if you are looking to try some new craft beers. With more than 70 breweries in the city, Portland is the city with the biggest volume of beer in the country. In keeping with the hipster mentality of the city, the Widmer Brothers were creating craft beers before craft beers were a thing. Here you can find the city’s first nonprofit brewery, Ex Novo. Another achievement to grant the hipsters of Portland with is the revival of Pabst beer. It would take many hangovers to get through all the selections of craft beer available in this great city. One way to enjoy all the great beers from around the country without having to purchase a plane ticket is a pub crawl of all the bars of Downtown Las Vegas. Contact Vegas Pub Crawler and book your pub crawl of DTLV today.